While this is true in order to make sure you keep the value of your assets through the crisis period, it is another story when we are talking about investing as in “To commit (money or capital) in order to gain a financial return”. Then I dare to say that buying a house is no investment. When buying a house there are not goods or services produced for others in the hope of a profitable sale; so if someone buys it in the hope of realising some profit that is pure speculation. 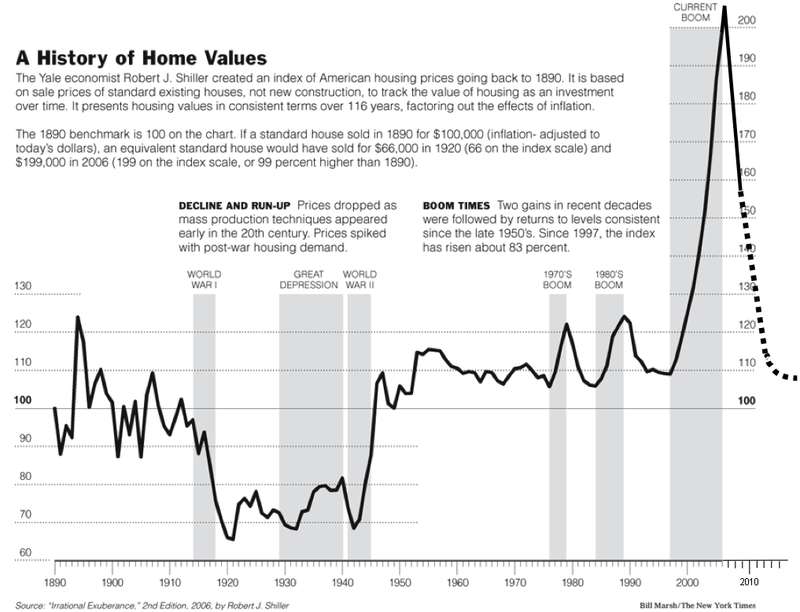 After having said this, I wanted to share two graphics from Case-Shiller Home Price Indices for American houses since 1890… In the first graphic you can see that after adjusting for inflation at the end of the 20th century, in absence of crisis and booms the value of a house was nearly the same than 100 years before, merely 10% higher. Why should it be higher if no goods/services are produced? Then you can see the boom that took place in the 2000’s up to mid 2006. That was pure greed and speculation. Case-Shiller Home Price Indices for American houses, 1890-2006. In the second graphic you may see the prediction made based on Case-Shiller Home Price Index. 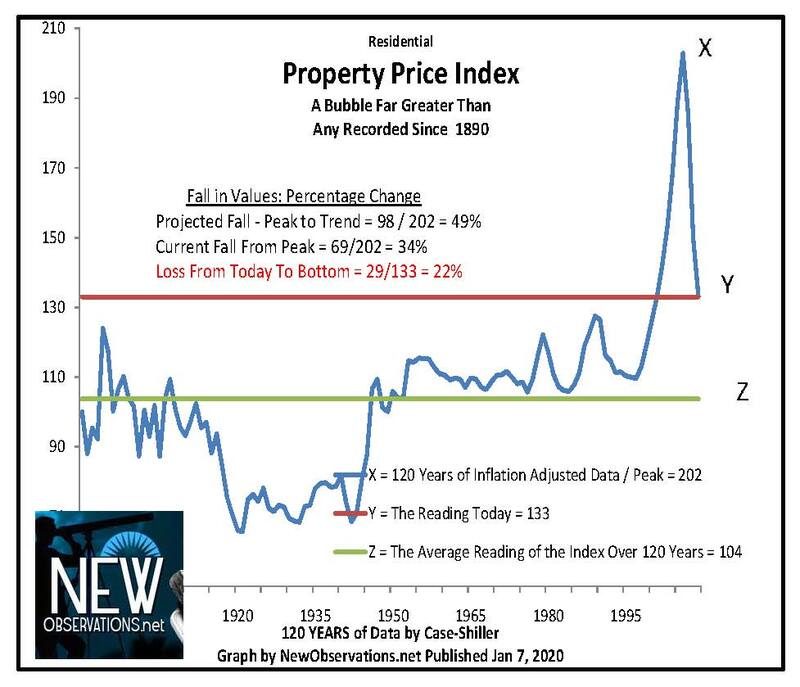 The prediction is pretty simple: there is no reason to forecast that homes prices have to stabilise at a higher point than the average of the past 120 years… other way to say that a home does not generate any value (still, it doesn’t destroy value either!). Case-Shiller Home Price Indices for American houses, 1890-2009 and forecast. It might still be a good idea to buy property if the ultimate goal is not to make money but to maintain money. I think with property (not the apartment kind of Madrid, but land, with or without dwellings on it) the investment is mainly in the safety. It is a comforting idea to be able to grow your own potatoes if it should ever come to that. Definitely, with a house you at least “know” that it’ll retain it’s value in the long term… problem is when that term is 30 years (e.g. 1915-1945, though, yes, there were two World wars in between…). Buying a house you ‘know’ will retain its value is speculating already. You never know. Who in detroit in 1960’s would have thought 40 years later it would be difficult to sell your house?